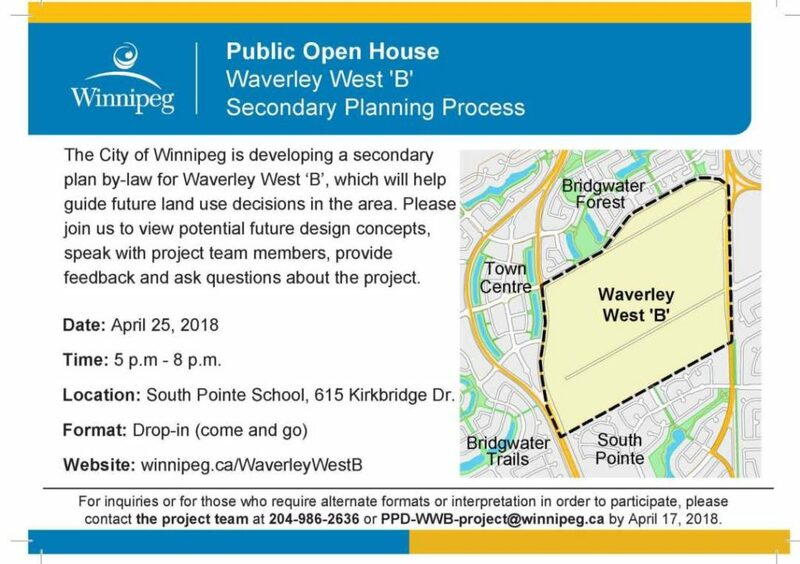 Following multiple landowner and stakeholder meetings, the City will now be holding a Public Open House on the land use planning process for Waverley West Neighbourhood ‘B’. The City of Winnipeg is conducting Secondary Plan By-law for the area known as Waverley West Neighbourhood ‘B’. A Secondary Plan By-law relates to land use and provides policy direction on how land is to be developed (ie: location of roads, water and sewer pipes, parks, residential and commercial areas, schools and recreation complex sites, etc.). This public open house will reflect extensive discussions with area residents and planners and will invite the public to provide input. LOCATION: South Pointe School, 615 Kirkbridge Dr. The planning process is a critical step in preparing the land for future developments (ie: schools, recreation centres, commercial, etc.). Neighbourhood ‘B’ is one of seven neighbourhoods and the final one to be developed in the Waverley West area of SW Winnipeg. The other neighbourhoods which have already been developed are Bridgwater Forest, Bridgwater Lakes, Bridgwater Trails, Bridgwater Centre, South Pointe and Prairie Pointe.